What if you had always dreamed of something more . . . ? Nell McNamara has a happy life: her boyfriend Olly adores her, their four-year-old daughter Petal is the centre of their world and Nell has a steady job in the local chip shop. When the chippy needs a makeover, Nell jumps at the chance to unleash the creativity fizzing inside her. Inspired by what she can achieve - and encouraged by the very best friends a girl can have - Nell is determined to try something new. Waving goodbye to the chip shop, she starts up a new business making her own line of must-have handbags, which are soon flying off the shelves. It seems Nell's dreams are finally coming true, but her success doesn't come without a price. Before too long, Nell has to ask herself if it's really possible to have it all . . .
Full of fun, love and laughter, soak up the sunshine with Summer Daydreams. 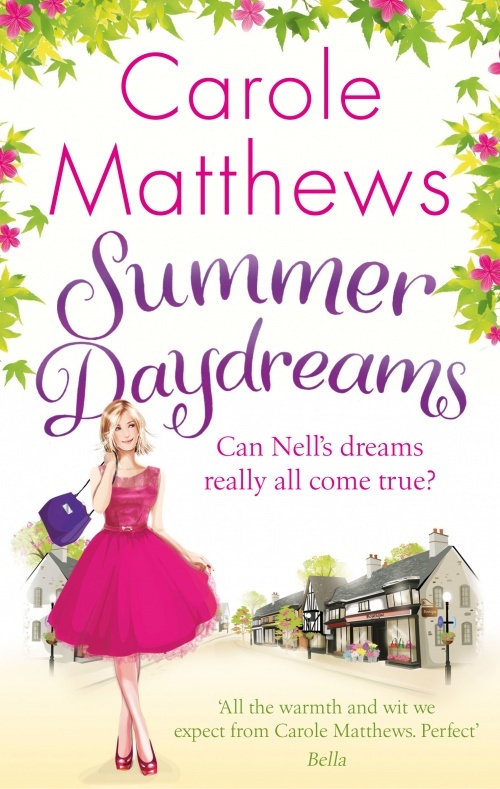 Nell McNamara has all in her life, a job n a local chip shop, a boyfriend and an adorable daughter. When the chippy needs a makeover, Nell jumps at the chance to unleash the creativity fizzing inside her. After this makeover, her life starts to change. She wants to make her own line of handbags but her success doesn’t come without a price. I loved reading this book, full of hope, love and determination. Leading us in the world of business. When you read this story, you can’t stop having hope for Nell McNamara who is full of determination and her courage. Thank you to Carole Matthews.